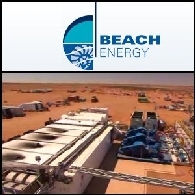 Beach Energy Limited (ASX:BPT) advises that oil production has commenced through the new Western Flank flowlines, which are tied-in to the Moomba facility, with production to be scaled up over the course of December 2012. 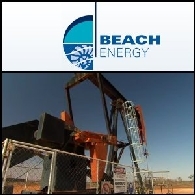 Beach Energy Limited (ASX:BPT) has been advised by the operator, Senex Energy Limited (ASX:SXY), of a new field oil discovery at the Mustang-1 exploration well in PEL 111 (Beach 40%, Senex 60%). 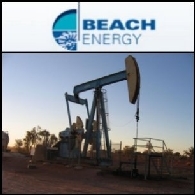 Beach Energy Limited (ASX:BPT) advises that Senex Energy Limited (ASX:SXY), operator of the Growler oil field on the Western Flank of the Cooper/Eromanga Basin, has today announced a major reserves upgrade for the field in PEL 105/PRL15 (Beach 40%, Senex 60%). 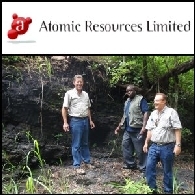 Beach Energy Limited (ASX:BPT) (PINK:BEPTF) has released a monthly drilling report for December 2011. Beach Energy Limited (ASX:BPT) (PINK:BEPTF) has been informed by Santos Ltd (ASX:STO) that the pipeline between the Tantanna facility and the Gidgealpa facility is now back online and is flowing at approximately 5,500 barrels of oil per day ("bopd"). The re-commissioning of the Tantanna pipeline is over two months ahead of Beach&apos;s initial expectations. 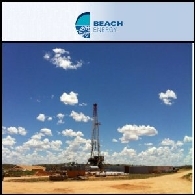 Beach Energy Limited (ASX:BPT) (PINK:BEPTF) provides the monthly drilling report for October 2011. Asian Activities Report for August 24, 2011 includes: TVN Corporation Pty Ltd (ASX:TVN) announced the results from its latest drilling activities at the Nuurst Project in Mongolia; PMI Gold Corporation (ASX:PVM) reported further positive drilling results from its 100%-owned Obotan Gold Project in Ghana; Senex Energy Limited (ASX:SXY) secures agreement for the pipeline transportation of crude oil from Snatcher oil field; Australia Minerals and Mining Group Limited (ASX:AKA) has updated its kaolin resource at Yilgarn project areas in Western Australia; Biocon Limited&apos;s (BOM:532523) subsidiary Clinigene International Limited has signed a strategic partnership agreement with Spaulding Clinical Research, LLC. 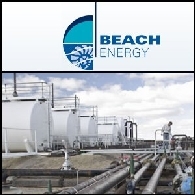 Beach Energy Limited (ASX:BPT) (PINK:BEPTF) advises it has signed an agreement with Senex Energy Limited (ASX:SXY) to tie-in the Growler Field (Beach 40%) to the Lycium oil field. It has also agreed with Senex to construct a trunkline from Lycium to the Moomba facility, however, the tie-in of this section remains subject to approval from the South Australian Cooper Basin (SACB) Joint Venture (~Santos Ltd (ASX:STO) 67%, Beach 20%, Origin Ltd 13%).